This freeware application provides a user interface functionality to the popular LAME codec. It converts mp3 to wave and wave to mp3 for free and also supports batch operations similar to many image conversion utilities. 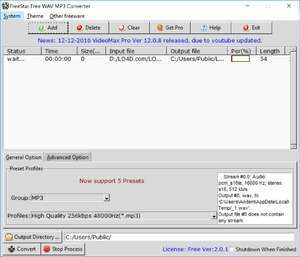 MP3 files created by the Freeware WAV to MP3 Converter can be played back on several different devices and on PC programs like Winamp or VLC Media Player. For security reasons, you should also check out the WAV to MP3 Converter download at LO4D.com which includes virus and malware tests. Additional screenshots of this application download may be available, too. Freeware WAV to MP3 Converter has a presence on social networks.